Island dwarfism can be found on virtually every Mediterranean island of a certain size. But it is not just an Mediterranean feature. Island dwarfism happens everywhere around the world where mammals were forced to depend on less food and had no other species hunting them. 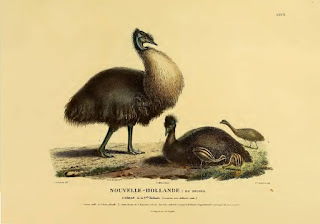 Australia's iconic emu (Dromaius novaehollandiae novaehollandiae) is the only living representative of its genus, but fossil evidence and reports from early European explorers suggest that three island forms (at least two of which were dwarfs) became extinct during the nineteenth century. While one of these – the King Island emu (Dromaius novaehollandiae ater) – has been found to be conspecific with Australian mainland emus, little is known about how the other two forms – Kangaroo Island emu (Dromaius novaehollandiae baudinianus) and Tasmanian emu (Dromaius novaehollandiae diemenensis) – relate to the others, or even the size of Tasmanian emus. Now research has found that that all the island populations represent sub-populations of mainland Dromaius novaehollandiae. Further, the size of island emus and those on the mainland appears to scale linearly with island size but not time since isolation, suggesting that island size – and presumably concomitant limitations on resource availability – may be a more important driver of dwarfism in island emus, though its precise contribution to emu dwarfism remains to be confirmed. This was the surprise finding of a study that analysed the DNA and bone measurements of the now extinct small emus, using both ancient and modern museum specimens. The study revealed that the small stature of the island emus evolved relatively quickly. 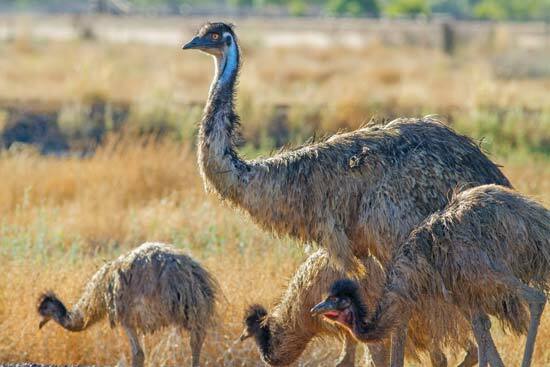 “Our results have shown that all the island emus are genetically closely related to the much larger mainland emu," says lead author Dr Vicki Thomson, an Australian scientist. "The leg bones, a measure of overall body size, show size differences from the smallest, found on King Island, to the largest, on the mainland, with Kangaroo Island and Tasmanian emus in between," she says. "The smallest, the King Island emus, are typically two-thirds of the size of our mainland emus, with others ranging upwards according to the size of their island." Co-author Dr Kieren Mitchell says: "This suggests that island size, and presumably the associated reduced food resources available, may have been important in causing smaller body size in island emus." "We do know that prior to European arrival, Kangaroo Island, King Island and Tasmania had these smaller bodied emus and they would have been isolated from the mainland after sea-levels rose around 10-15,000 years ago. "The change in body size thus appears to have happened quite quickly, and independently on each island." Thomson et al: Genetic diversity and drivers of dwarfism in extinct island emu populations in Biology Letters – 2018. See here.